One of the most appreciated services I offer (and one I get such a kick out of!) is sitting with a client and helping to design a wall display (or two or more) for their home. By far, this was the one thing (OK, besides helping to pick out the best images) my friends and clients said they would dearly love when I first started this business. Lucky for me (and them, of course), I thoroughly enjoy giving ideas on the possibilities. Perhaps it harkens back to my old scrapbooking days…a blank wall being like a blank page and such. For many people though, an empty wall could present either a blank canvas upon which endless possibilities await or a symbol of frustration and…procrastination. Oftentimes, it’s the latter. After the painstaking process of whittling down the many fantastic images to a select few, the question (or questions) then becomes, “Now what?” After expending all that energy on choosing photos, the last thing many of my clients want to do is to simply leave the photos in the box they arrived in BUT as often happens, life gets in the way. So I work with them as closely as possible to put a plan together for that display so that when everything arrives, they’re ready to put everything onto the wall. Many of my clients order canvas gallery wraps not only because of the modern elegance it gives their room but because they come ready to hang with hanging hardware already attached to the back. 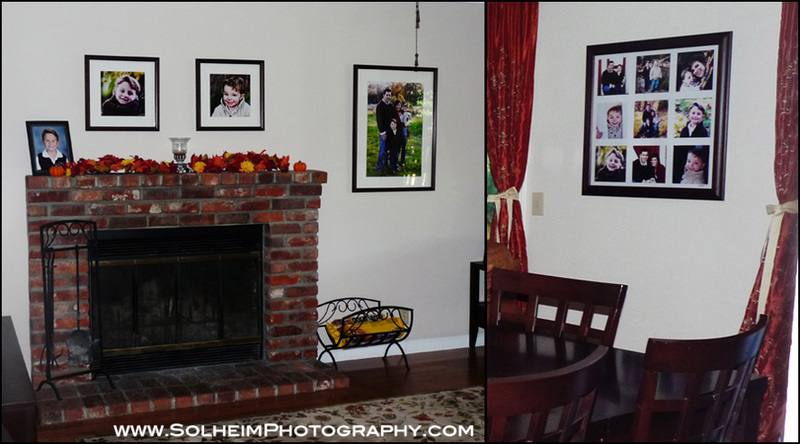 Some order framed prints because of the traditional look that suits their decor. And when everything comes in, sometimes everything is hung according to plan while others acted on new inspiration once the art pieces were in their hands. Either way, I love it when my clients send me photos of what they’ve done with their art pieces. It gives me that warm and happy feeling inside. These family photos live in the family room. 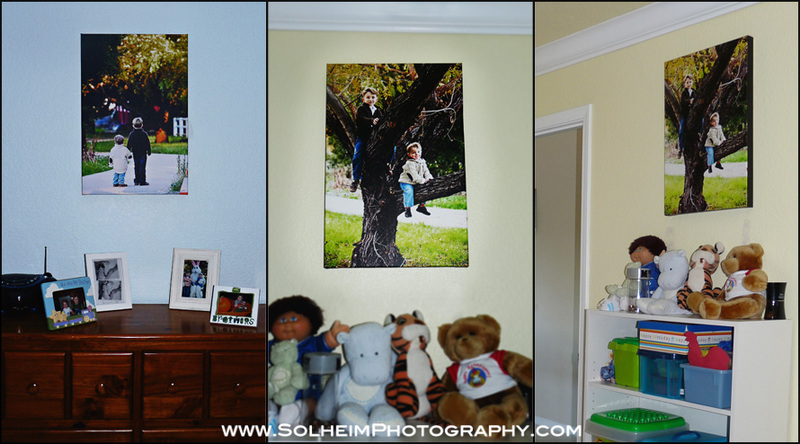 The square images are about 10″x10″ while the vertical family image is 16″x24″. 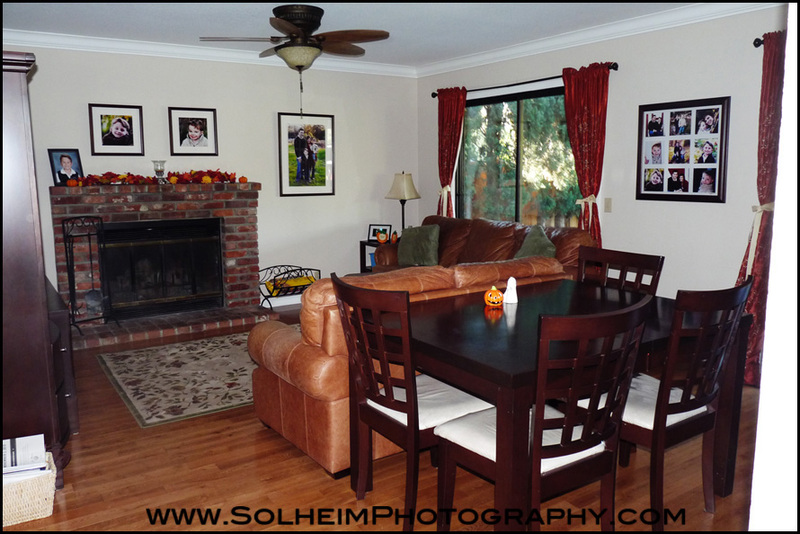 The storyboard on the right wall next to the dining table is 20″x20″. Check out their session here.